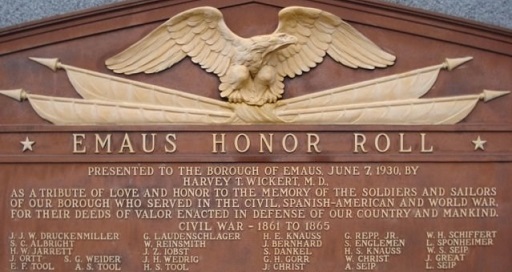 Located in a triangular-shaped mini-park between 3rd and 4th Streets in the Borough of Emmaus in Lehigh County, Pennsylvania, the Emaus Honor Roll is one of the smaller memorials which pays tribute to members of the 47th Regiment, Pennsylvania Volunteer Infantry and other veterans. Dedicated on 7 June 1930, the memorial was presented to the city by Harvey T. Wickert, M.D., and was erected to honor men from the community who had served during the Civil War, Spanish American War, or World War I. A second, smaller monument was erected nearby to honor all veterans, regardless of the conflict in which they served.